Combine chickpeas and 4 cups water in pressure cooker; bring to a boil. Lock lid in place. Bring to high pressure over high heat. Reduce heat, and cook 2 minutes. Release pressure using automatic pressure release, or carefully transfer cooker to sink, and run cool water over rim of lid. Remove lid, tilting away from you to let steam escape. Rinse and drain chickpeas. Set aside. Heat oil in pressure cooker over medium-high heat. Add onion and garlic; sauté 3 minutes, or until onion is soft. Add chickpeas and 3 cups water. Lock lid in place. Bring to high pressure over high heat. Reduce heat, and cook 15 minutes. Release pressure using automatic pressure release, or transfer cooker to sink, and run cool water over rim of lid. Remove lid, tilting away from you to let steam escape. Stir in squash and collards. Lock lid in place. Bring to high pressure over high heat. Reduce heat, and cook 5 minutes. Release pressure using automatic pressure release, or transfer cooker to sink, and run cool water over rim of lid. Remove lid, tilting away from you to let steam escape. Stir in tomatoes; cover, and let stand 5 minutes. Stir in harissa. Season with salt and pepper, if desired. Meanwhile, prepare couscous according to package directions. Fluff with fork. 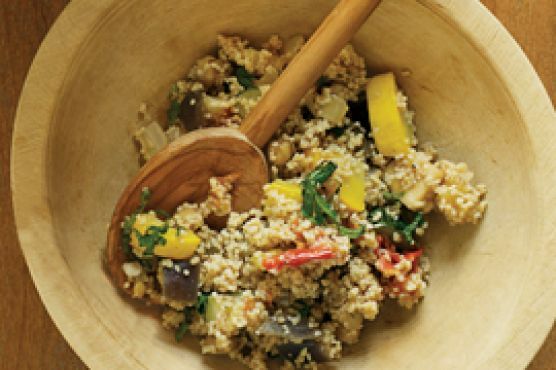 Serve tagine over couscous. Sprinkle with cilantro, and garnish with lemon wedges.